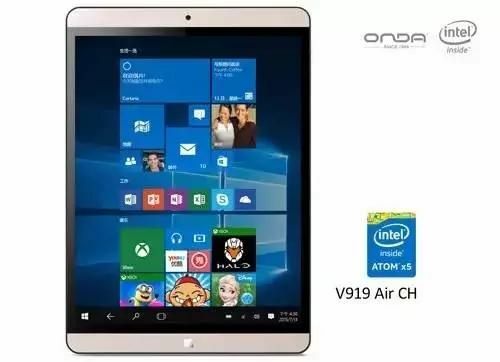 Onda is one well known tablet pc supplier in China, it is also the first one in China adopting Intel Core M processor and Windows 10 operation system. Recently, Stcamusa disclosed one new tablet pc from Onda, V919 Air CH. This Onda V919 Air CH will adopt Intel Cherry Trail processor which is based on 14nm process technology and Intel Atom X5 framework. Cherry Trail integrates the 8th generation Intel HD Graphics and adopts the latest Intel Core Speeding technology. Adding on the 4GB RAM, and 64GB flash memory, its performance is very high. More important, Onda said the price of this tablet will be quite reasonable. This unit adopts 9.7 inch IPS screen, resolution is 2048*1536 pixels, PPI is 264. Screen ratio is 4:3 Its net weight is only 450g. Compared with other 9.7 inch tablets in market, the thickness of this V919 Air CH is 20% slim. In meanwhile, this unit has 4GB LPDDR3 RAM, frequency is 1600MHz, compared with DDR3 RAM, its processing capacity is much better, and power consumption is reduced by 20%. It comes with latest USB 3.0 host and HDMI output. Though Onda did not tell too much about this tablet, we believe this unit will run dual operation system, Windows 10 OS and Android 5.0 or above. As estimation, it will be for sale at year end.